Lawton Stables, located in the heart of Sea Pines Resort on Hilton Head Island, is home to a community of animals whose impact on their guests never fails to amaze owner Didi Summers. “What has surprised me is how much joy animals bring to people—adults and children.” Prior to buying the stables in 2008, Summers found herself frequently driving by with her children thinking, “I could do a little better.” As she renewed and renovated the facility into the gorgeous community-centric place it is today, Summers created a much-improved home for the animals; committing herself and her resources to the care and keeping of the menagerie entrusted to her and her team. “We have families who come to our resort community who have special needs children,” Summers said. 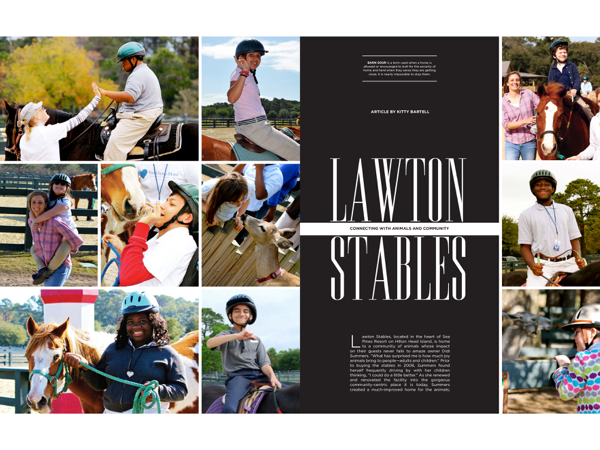 “There should be a place for those children where they can have their own activities; where they can have fun, grow and learn.” The EAL program at Lawton Stables is operated through Wish Upon a Horse, a non-profit founded by Summers. “We’re having more and more families who come to Hilton Head just because of this program.” In addition to the programs offered to island visitors, 8-week EAL sessions are scheduled free of charge to local special needs children during the off-season. The Wish Upon a Horse EAL program at Lawton Stables relies on donations and lots of volunteers. “Depending on the severity of the child’s condition or their needs, we have one to three volunteers per child along with a head instructor,” Summers said. PATH certified head instructor Erin Sullivan interacts with the families prior to scheduling a visit to determine if they fit the program’s mission, and if there are any contraindications to riding. In addition to its working herd, Lawton Stables is home to a family of boarded horses where unparalleled care and keeping is standard operating procedure; providing security and peace of mind for both local horse owners and those who are not in the area on a full-time basis. “We’re pretty unparalleled in what we offer. We have proper footing in the arenas. We keep them watered and they are crowned in order to drain properly, so when a horse’s hoof lands it is protected with not too much sinking,” Summers said. “We have happy people here all the time,” Summers said. Much of that joy is generated by Lawton Stables small animal farm, where everyone is welcome to interact with the residents free-of-charge; deer, goats, mini cattle and mini donkeys, pigs, alpacas, chickens. But no resident of Lawton Stables has captured more hearts or received more fan mail than Harley the Clydesdale, found strolling the pasture daily; interacting with both four-legged and two-legged friends. “The first time we brought Harley in, I think to see the farrier, we got twenty calls. Where’s Harley? What happened to Harley?” Harley and all his mates are doing just fine. After all, it’s a very happy barnyard at Lawton Stables. 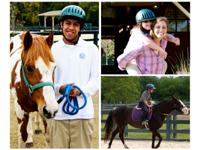 Lawton Stables is located in Sea Pines Resort at 190 Greenwood Drive, Hilton Head Island. 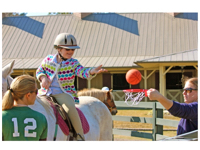 For more information about programs and opportunities or to make reservations, please call (843) 671-2586 or visit lawtonstables.com.